When we downsized our house 2 years ago, we knew we wanted to create a house that was instantly a home. We didn’t want to fill our new home with a ton of store purchased items that are in thousands of other homes. Ours should be unique to us and our story. The same goes for our children’s bedrooms. Just like we want our living room and kitchen to speak to us and make a statement, we wanted to allow our kids that chance too. I thought we would have an easily clutter-free way of life with the shelving in our daughter’s closet. As it turns out, those shelves just turned into more places to shove junk and toss unfolded clothes. We had to do something. So I set out on a mission to start a DIY modern, minimalist kids bedroom on a budget. *This is a sponsored post in which I was compensated through product or payment. All opinions are my own. The best way to create a home instead of a house is by using items that already make you feel warm and fuzzy inside. Like this bed that my grandmother painted for me when I was young. What better way to design a bedroom on a budget than by using what you already have? Sure, it still says my name on it, but I absolutely love tucking my daughter into the same bed my dad and grandma used to tuck me into at night. I love seeing my “Grammy’s” artwork as a part of my home. I don’t know what I will do when my daughter actually out-grows this bed. When that time comes, I will have to get crafty, because I refuse to let it go. Under the window, I strung pieces from my daughter’s baby mobile across a thin strip of wood. These little butterflies and cherry blossoms have been with her since she was born. On the other side of the room, draped over a chair, is a small pink blanket my other grandmother knitted just for my daughter. It’s so special to have little pieces of our family history keeping her cozy at night. Again, none of these things cost me a thing. Making good use of sentimental items you already have the best way to create a bedroom on a budget. When you are working with a small room, it’s important to remember to keep the walls light in order to help the room feel open. Searching for beautiful, modern paint colors is so important when creating a welcoming small bedroom space. 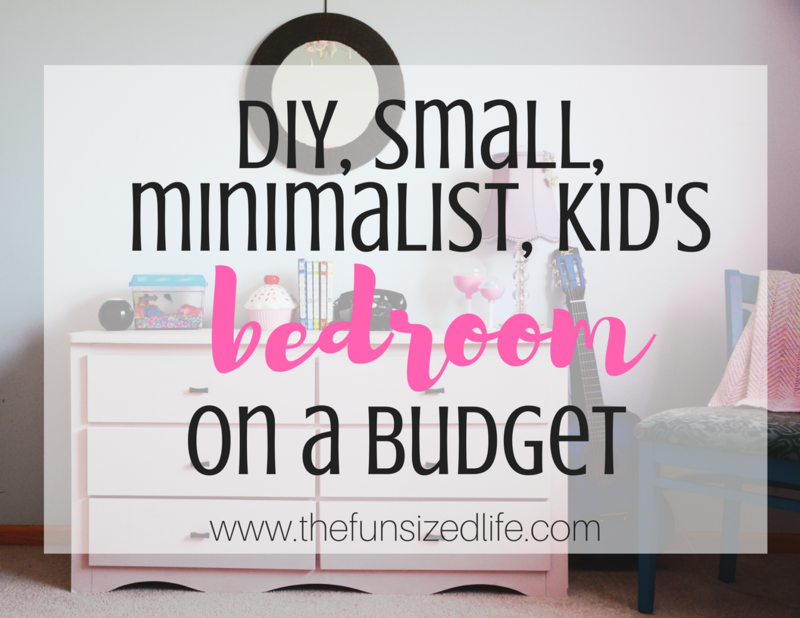 This is especially important if you are creating a minimalist kid’s bedroom. Bright colors can add a little too much chaos and can take away from the simple, small bedroom feel. Keeping the walls lighter also allows you to create better focal points for accent pieces that you really want to show off. No one wants a wall that is so over-powering your eyes can’t focus on the decor inside them! Instead of over-loading a small bedroom with props and decor, try sprucing up the room by sprucing up the walls. This way, you are not adding any additional clutter, but at the same time, you are working to create a unique space. For my daughter’s room, I chose to paint a cherry blossom-like tree since that was the theme of her nursery as a baby. If you are not one for freestyle design, there are always decorative stencils you can use to create beautiful works of art with minimal effort. When you can’t seem to find the right piece of furniture to add to your room, it’s time to create your own! This has been one of my favorite parts of living in our small home. I will thrift shop for months just waiting for the perfect piece to bring home. From there I can paint it and decorate it to fit in with our unique style. As I said before, my daughter’s closet was becoming a storm of chaos and clutter. That’s why I set out on the hunt for the perfect dresser. I knew we needed quite a few drawers and something stable and sturdy that hadn’t been previously painted. Creating a unique space means really taking your time and being patient so you are getting exactly what you want. After I found the perfect dresser, I needed the perfect paint to get started. More than anything I needed some high-quality brushes that were designed specifically for Chalk Paint®. Previously I had just used whatever paintbrush I could find at the local hardware store. Quickly I learned this was not the most effective method. There are actually several different types of brushes that work best for refinishing furniture. Luckily, Chalk Paint® by Annie Sloan had every single thing I needed in order to help me create a professional looking dresser for my daughter. The paint color I wound up selecting was called Antoinette. It was a very light, elegant shade of pink that I knew would fit in with the small bedroom, calm feeling I was going for. If you are just working your way into furniture painting for the first time, I want to just take a moment and share with you some of the things that I have learned so that you are sure to succeed the first time and can create pieces that you truly love. While Annie Sloan’s line of paint doesn’t require sanding before painting, it can be a good idea if you are working with a really roughed up piece. Be sure to clean up your piece before you begin painting. This is especially important if you have sanded, or if there is residue built up on your item. Make sure you use the correct brush! You may be able to see in the photo above that I was so excited to start painting, I got my wax brush mixed up with my flat brush! I didn’t realize this until I started re-watching some of Annie Sloan’s painting tutorials. –Don’t worry, I caught myself before it went too far! Make sure you allow time for your paint to dry in between coats. After applying my wax, I let the dresser sit for an entire day before bringing it inside. I’m so thankful I took the time to ensure I was working with top quality brushes that were designed specifically for chalk painting. My daughter is so proud of her new dresser and she loved watching me create it for her step by step. Check out the finished product. Oops! Looks like the bottom drawer handle needs a tune-up! This dresser wound up making such a perfect statement in our daughter’s small bedroom! It created a perfect place to display her favorite books, her antique telephone from my mom, and even gave her fish, Bluie, a more stable place to call home! Poor guy. I finished off the dresser by spray painting the silver handles into a deep brown color and gave this old hand-me-down mirror a quick spray down as well. If you are trying to redo a bedroom on a budget, always consider making over what you already have before purchasing brand new. It is so important to keep the colors of a small bedroom very light and airy. Letting that natural light is important as well. We made sure to use sheer curtains in our daughter’s room to keep it looking and feeling fresh. The room is small, and so is the window, but you can tell by the photos just how much light was allowed to stream in. If you are creating a kid’s bedroom on a budget, make sure you let them have their say. I know it can be hard as a minimalist mom, for me to allow my children to have their toys. Sometimes it causes me anxiety. But who’s to say what is or isn’t important to them? Not me. When completing the finishing touches in my daughter’s bedroom, I made sure to keep out some of her favorite things. Stuffed animals, knick-knacks, and her guitar. Now more than ever she plops herself into her chair and starts strumming away. I’m so glad to have created such a minimalist, peaceful, kid-friendly place for her to feel at home in.